When I was pregnant with my children, I loved the whole pregnancy experience. I was so truly amazed with the whole process. The fact that an entire baby is developed within those nine months is truly miraculous. As beautiful as having a baby is, there is something pregnancy can cause that is not so beautiful…bladder leakage. Did you know that thirty-five million women experience stress urinary incontinence, a common type of bladder leakage, which can be triggered by coughing, sneezing, laughing, lifting or even exercise? With that many people suffering from this condition, wouldn’t it be nice to have a comfortable solution? 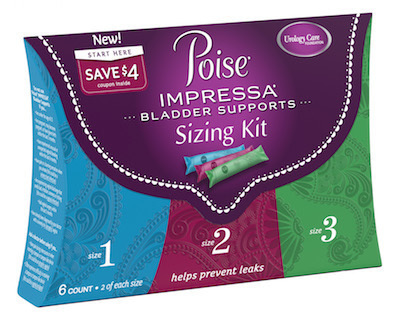 Poise has introduced the revolutionary new Poise Impressa Bladder Supports, the first and only over-the-counter internal product designed to help stop leaks before they happen. These Poise bladder supports can help discreetly prevent leaks for up to 8 hours every day so women can experience a renewed sense of freedom and confidence to live active, fulfilling lives. A very nice resolution, right? Here is some information on how these work. Poise Impressa Bladder Supports are inserted like a tampon. They are available in three sizes that adapt to the unique internal shape of each woman’s body. Women should start with the Poise Impressa Sizing Kit to find the size that helps effectively stop their leaks and fits most comfortably. Oh, and did I mention that they are safe, comfortable and effective? Unlike a tampon, Impressa does not absorb leaks like a tampon would; rather it gently lifts or supports the urethra to help stop leaks before they happen. Make sure you download this Poise Impressa coupon before you make your purchase of Impressa! Do you suffer from bladder leakage? 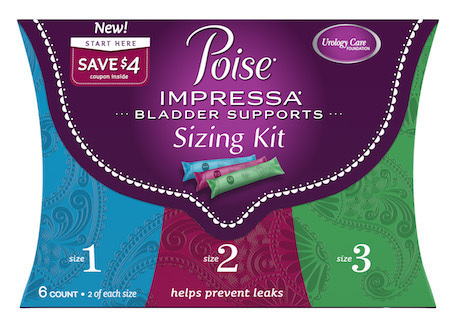 I’d love to hear your experience with Poise Impressa Bladder Supports!